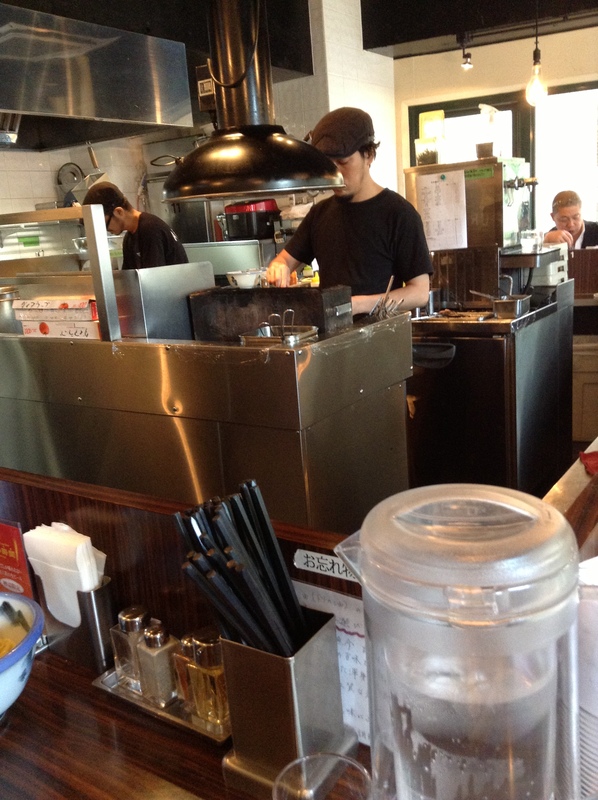 Shake Shack, New York City’s great burger chain, is in Tokyo at two locations, Aoyama and Ebisu. The Ebisu location is next to the station. I’ve passed by many times and the line was always too long. I was lucky today when I passed as the line, while still long, it was nothing like I had seen before and I jumped in. The current special is the ShackMeister of fried shallots on a cheeseburger. It is a great burger with the crispy shallots over the meaty burger. The crinkle fries with a cheddar and American cheese sauce were a nice touch of NYC. The seating area is big and there were two staff helping diners bus their trays and assisting diners to find seats. My fingers are crossed that the next Shake Shack will be on the Chuo line, maybe in Kichijoji? Tachikawa? Yoroshiku onegaishimasu. A good chef friend was visiting from NYC. 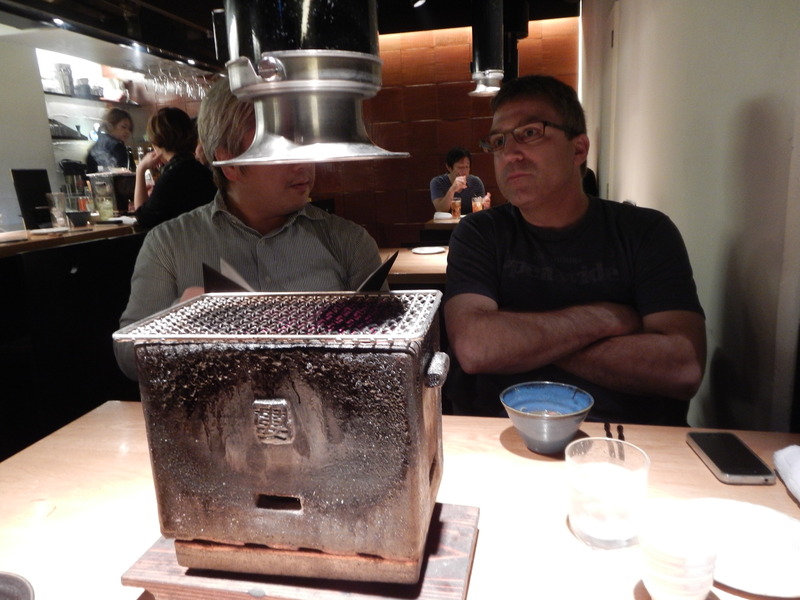 He’s lived in Tokyo for years and knows that Italian done by Japanese chefs is one of Tokyo’s greatest culinary treats. I was thrilled to hear we were going for Italian and that a food editor was picking our lunch spot. 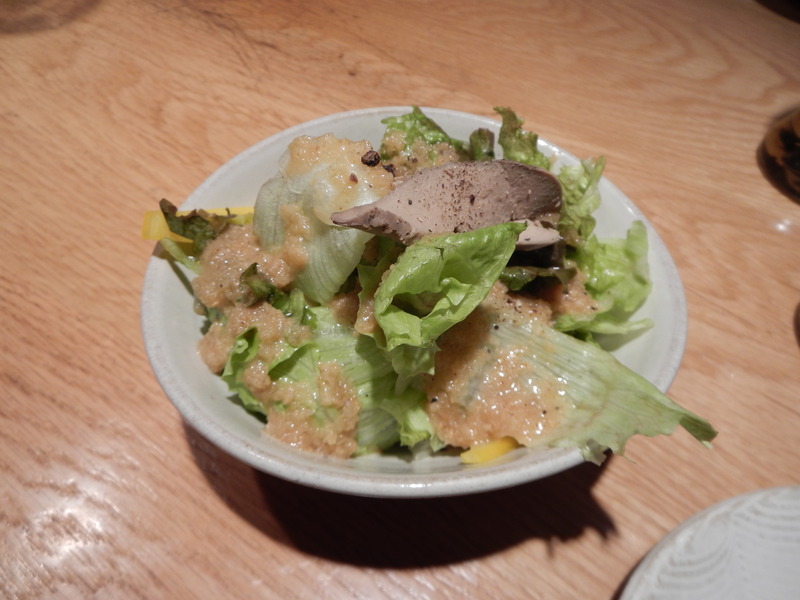 A tiny Hiroshima virgin oyster in the chilled soup was rich in umami. 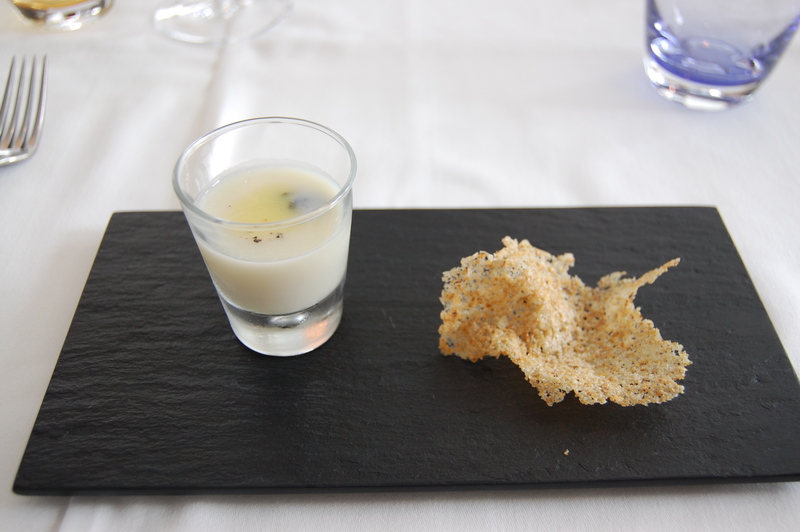 The skin of the potato was grated and used in the Parmigiano-Reggiano crisp, a brilliant Japanese concept of using every part of the product. Sazae, turban-wreath shell, is a tiny conch-shaped shellfish. Here it is sautéed in an aonori (laver) butter sauce and seasoned with some garlic chips. Some warm bread came just in time to soak up the butter sauce. Chef Tacubo excels in pasta and meat dishes. The pasta in this dish was well-seasoned as he seasons it with asari (littleneck clams) jus before plating. 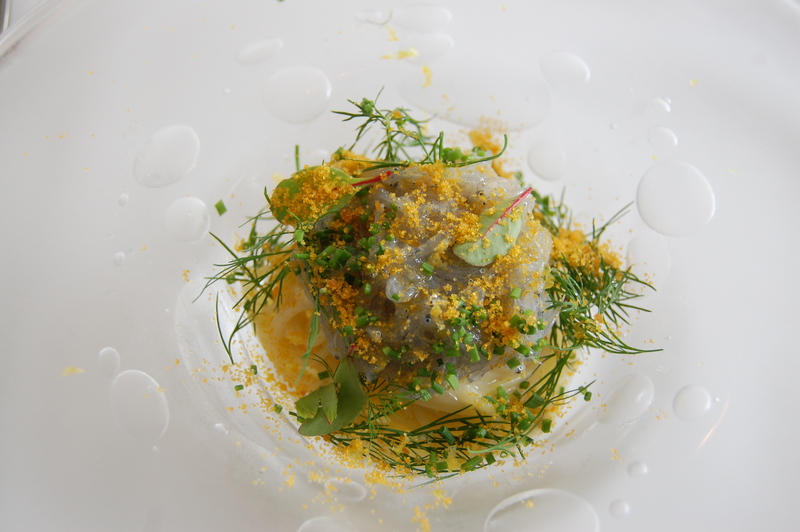 It is topped with fresh shirasu (tiny sardines) and karasumi (bottarga roe) and dill. A great fusion dish of East meets West. 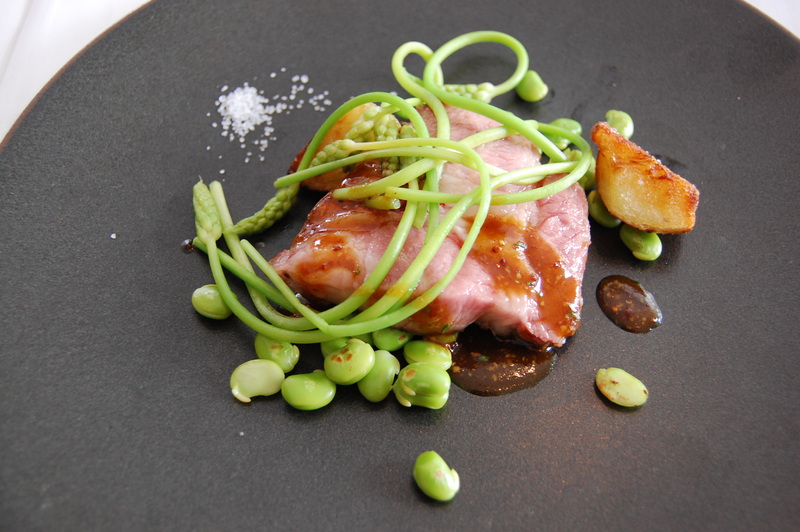 The pork from Aomori was well-balanced with the wild asparagus and edamame. The African salt pearls, I believe from Djibouti, are like large grains of sand. Sadly I had to head home early so I missed the dessert which was lemon-based. Aria di Tacubo is a short walk from Ebisu station. It is a tiny, well-lit spot at lunch. Only a few tables, about 16 seats, so reservations are required. We sat down to an empty restaurant at 12:30 p.m. and by 1 p.m. it was full. Chef Tacubo has a strong following so be sure to plan ahead. 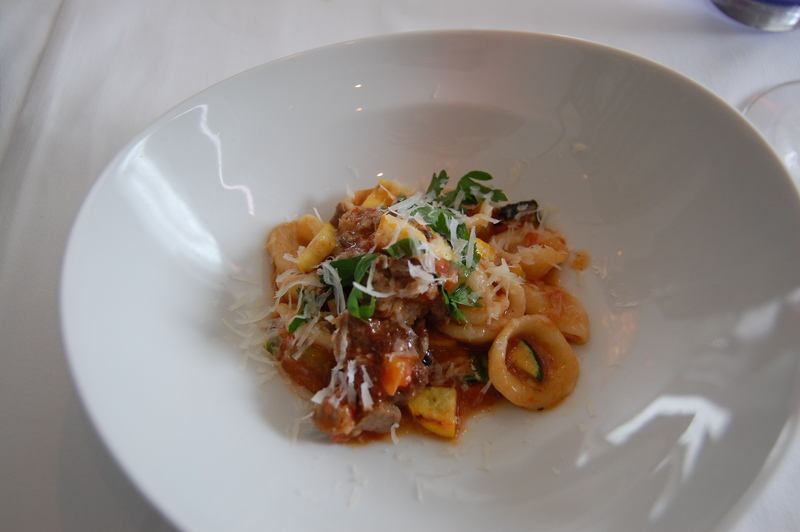 Lunch starts at 2,900 JPY for 3 courses with one pasta, but you’ll want to be sure to have at least two pasta, so starting at 4,900 JPY. 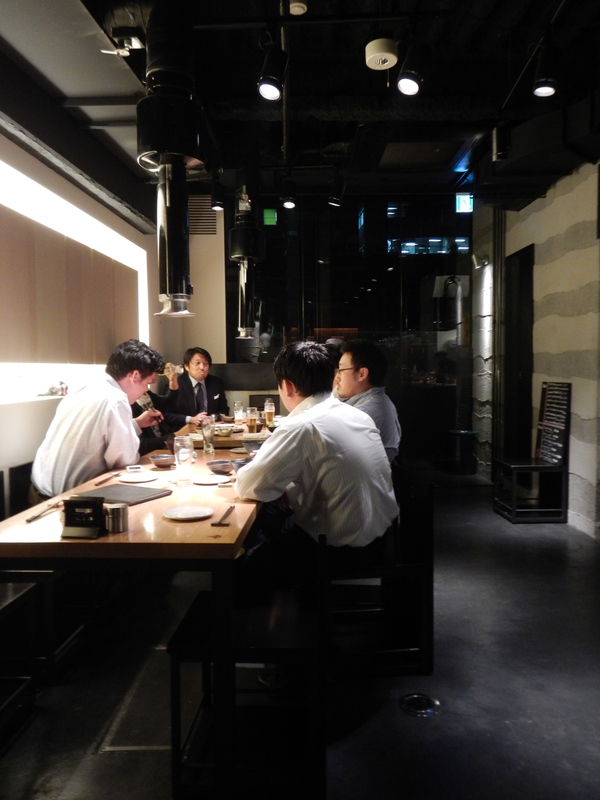 Dinner starts at 8,500 JPY. The wine list is not exclusive to Italy and we enjoyed a few wines with our meal. The sommelier was very helpful in helping us pair wines with the menu. Come here to see the sophisticated work of a Japanese chef who knows Japanese ingredients well and can assemble them into Italian cuisine. My NYC chef friend is right when he says that tourists to Japan are missing out on a big part of the food scene here by limiting themselves to Japanese cuisine. 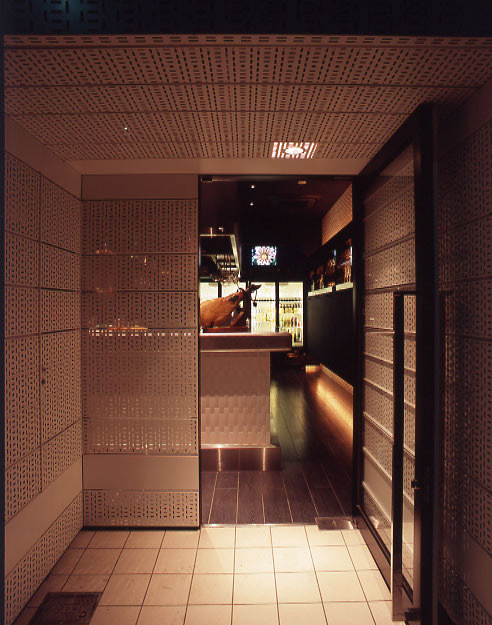 It is a great idea to have one Italian meal while in Tokyo, and Aria di Tacubo should be near the top of that list. Perhaps the greatest pleasure is experiencing the seasonal ingredients, this time of year includes the nama-shirasu and sazae. Bravissimo, chef Tacubo! ** Note, the restaurant has moved to a new location in 2016. The new address is reflected below. “Regular or extra fat?” asked the guy behind the counter when I handed over my ticket from the vending machine for Afuri’s yuzu shio (yuzu and salt) ramen. No brainer. Extra fat (ōi instead of futsū for regular). A few minutes later I could smell the yuzu as he placed the bowl in front of me. You can see the yuzu peel on the egg. 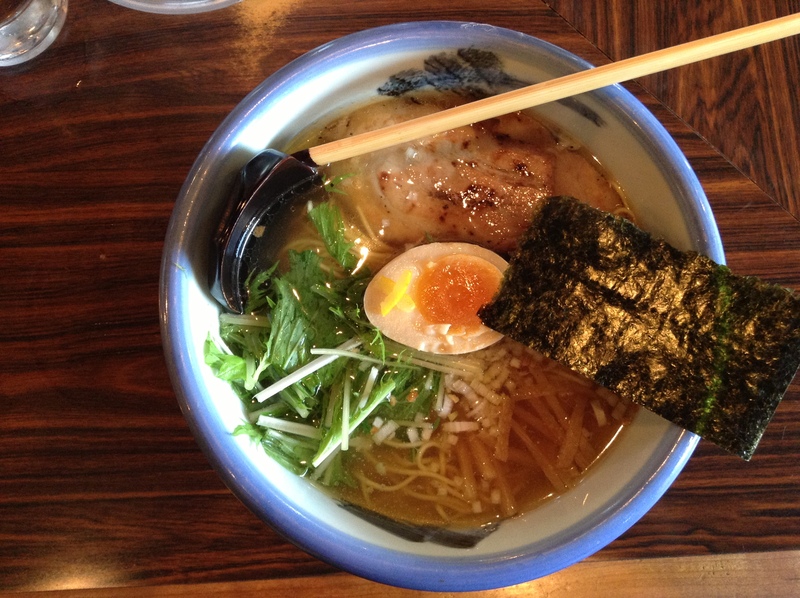 The yuzu shio is perfect on these chilly autumn days. It’s light and refreshing. The chashū is seared which adds a nice toasty note to the ramen. The egg is soft and full of flavor in the yolk. I love thin noodles and these are very thin. 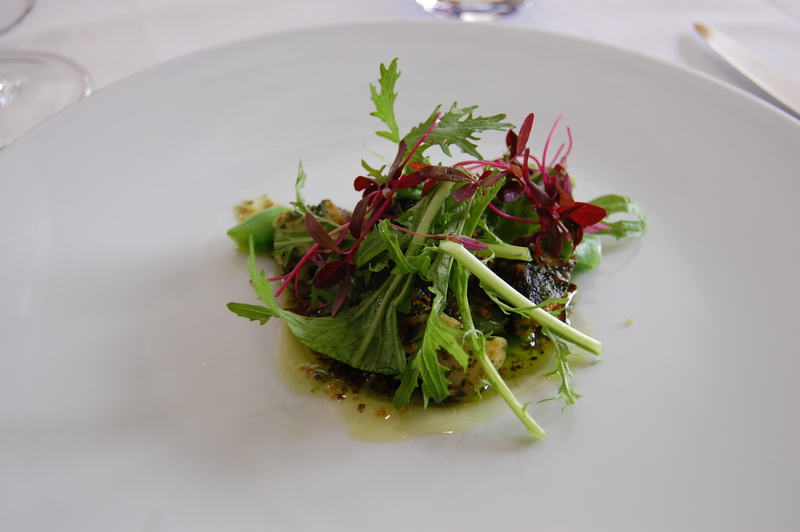 The mizuna is a refreshing, crunchy touch. One of my favorite bowls in the city. As for the extra fat, it was a rich bowl of ramen, but not too fat. A well-balanced bowl with a round feel of chicken schmaltz. The broth is chicken-based. All of the seats overlook the open kitchen. J-Pop plays in the background, think Hikaru Utada, while Hayao Miyazaki’s Kurenai no Buta (Crimson Pig) plays on the TV. Today the shop is filled with a mix of young girls out shopping, area businessmen, and some students. This shop is in Harajuku, about three minutes from the Takeshita Dori exit from the Yamanote Harajuku line. The shop front are large windows making the shop brightly lit during the day. It’s a very friendly shop and great for solo diners. The original shop is in Ebisu (Ebisu 1-1-7) and there is also a shop in Azabu-Jūban (Azabu-Jūban 1-8-10), and others in city. 10:30 a.m. – 3:00 a.m. 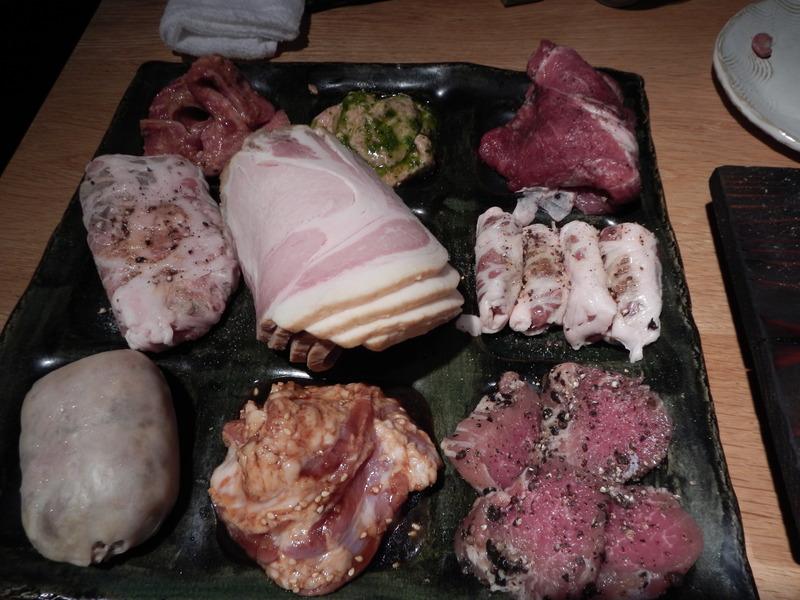 When I crave offal I usually head to the casual standing bar Saisei Sakaba in Shinjuku. 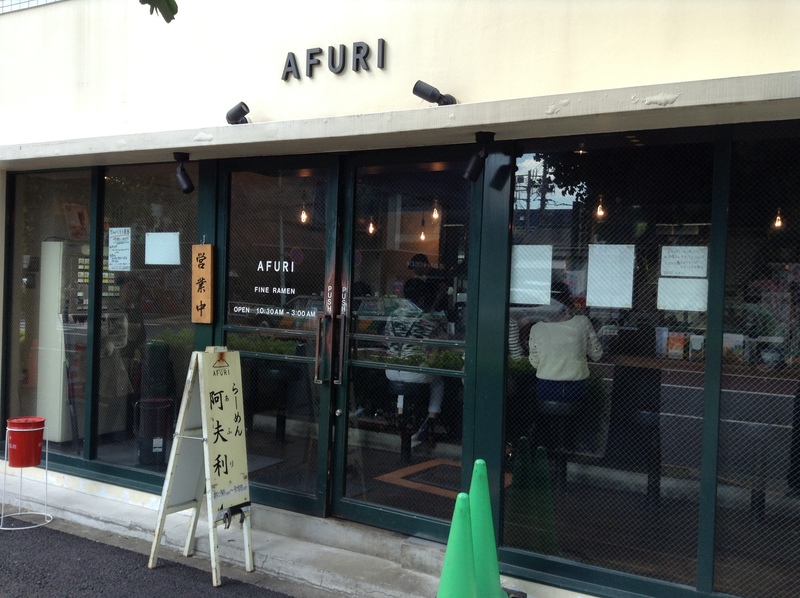 When I was contacted by the production team for Andrew Zimmern before his trip to Tokyo I suggested this restaurant and was thrilled to see it on his program. He is seen on the program behind the counter grilling skewered offal over charcoal with one of the chefs. On a recent night out with some fellow foodies we were introduced to a great offal restaurant by an editor from a food magazine. To get to Rukuma it’s best to meet someone who knows how to get there at Ebisu station and have them guide you there. That’s how it is for many restaurants in this city without street names. I know Ebisu fairly well and even I’m not sure if I could find my way back here. A short walk from the station along a busy street passing a ramen shop with a long line, several standing bars, and a few izakaya. At a stoplight our “guide” Mizutani-san, takes a right and then a left along the Yamanote line and we walk along the tracks until he says that we’ve arrived. I knew we were in for a treat when one of the first dishes we had included unique ingredients like cervix and natto koji. Offal is appreciated for its texture and flavor. 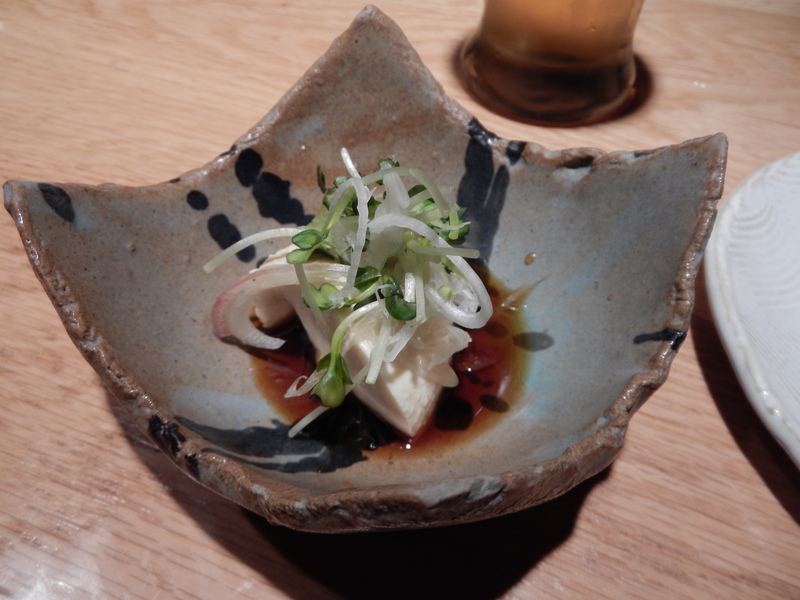 The chef was very creative to make his own natto koji and other ingredients you’ll see below. The salt-cured fresh black peppers from Cambodia was another new ingredient that a fellow chef at the table also was impressed with. 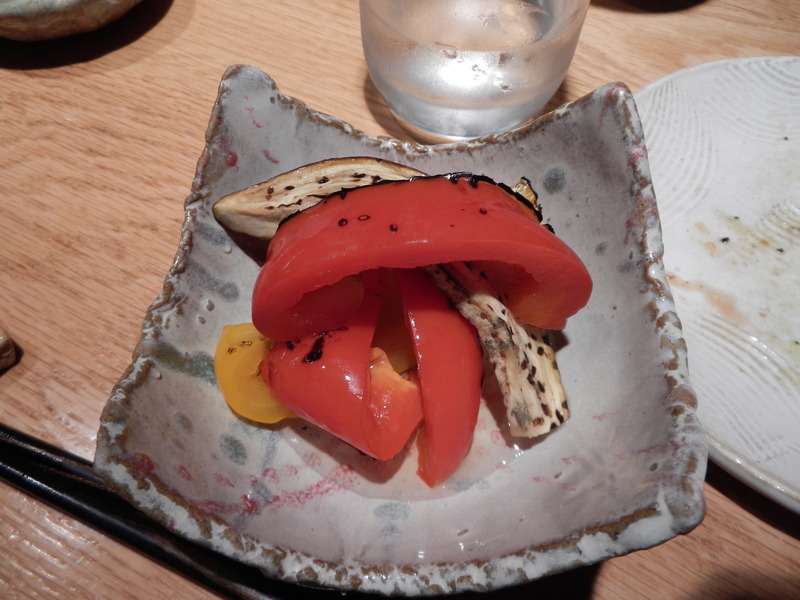 The chef suggested having the peppers with the food, but also to try it on its own. Salty with a pepper bite and a great texture like a hard caper berry. 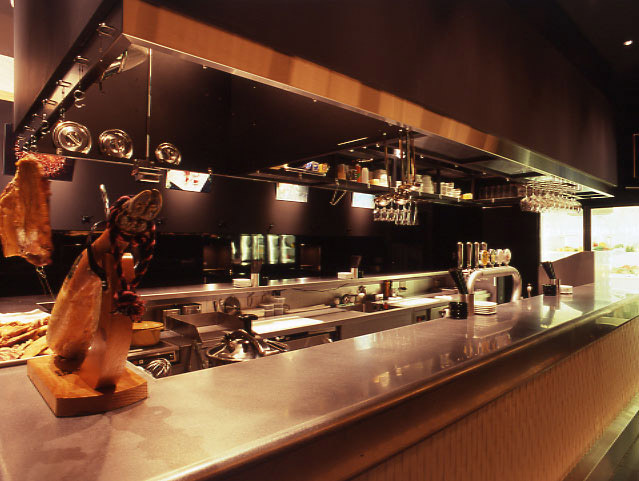 At this point the staff pull down the exhaust vent from the ceiling and bring a charcoal grill to the table. 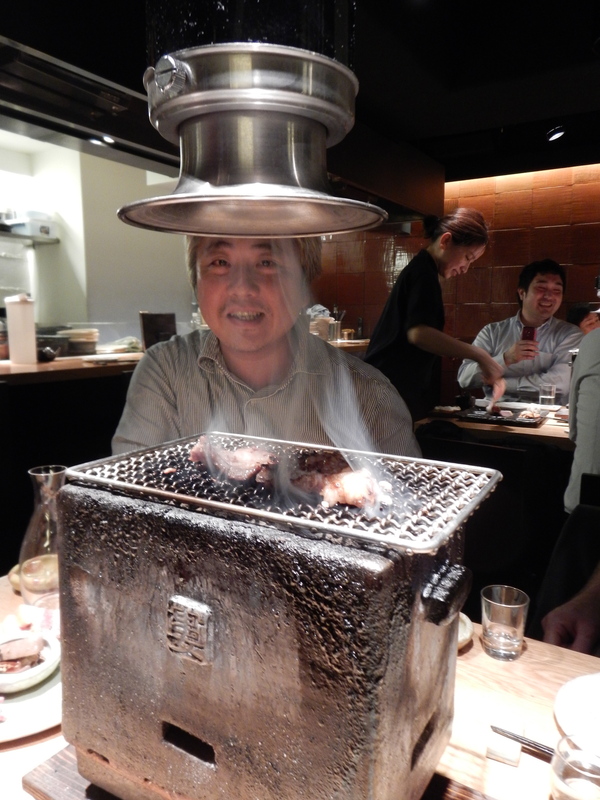 Maybe you recognize Japan’s most famous non-Japanese ramen chef in the photo? Hands down the favorite was the stomach fat wrapped around pork liver for its crispy outside but still raw inside. The homemade andouille sausage was also nice. 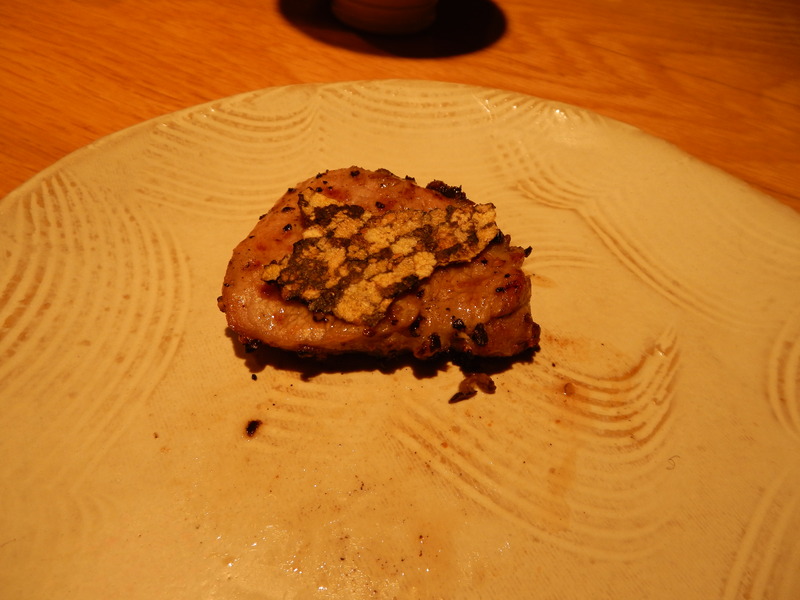 And, again, amazed to find yet another new ingredient – wine lees dried to a powder then used to add umami to the meat. This was also a new ingredient. Dried peppercorn pressed until paper thin. Leathery texture and a peppery bite. Would love this with a steak. At this point the staff asked if we were ready for another round. We asked for a smaller serving this time around. The vocal chords were great, slightly chewy. The shop has an outstanding saké and shochu list. Some good saké that is not on the menu as well, so be sure to ask your server if there are any off the list that they have. Some that we enjoyed this evening included a saké from Aizu Wakamatsu in Fukushima, Kikuhime from Ishikawa, and Kikuyoi from Shizuoka. 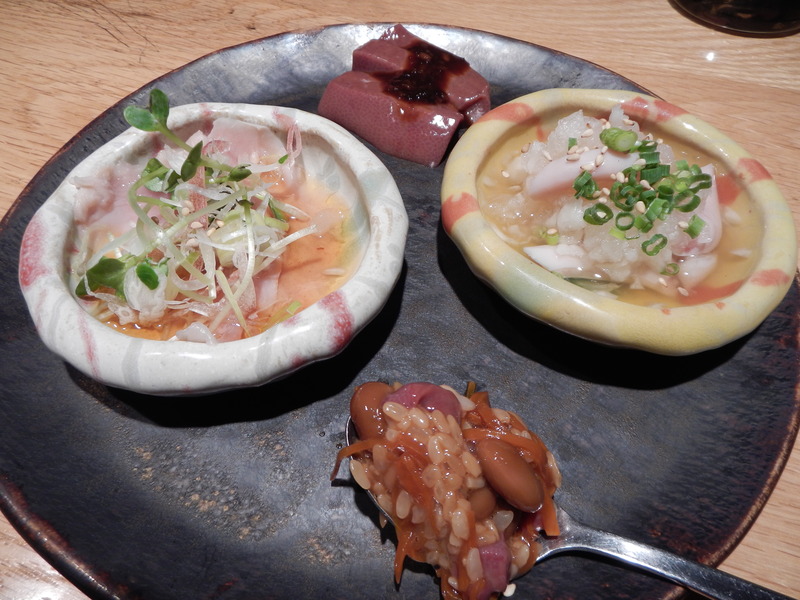 While there is a menu, it is best to just say “omakase” and let the chef send out different courses. The staff will ask you towards the end of the meal if you want to stop or if you want more. Just be sure to let them know if you have any food allergies.